Members of Master Builders KwaZulu-Natal South Coast region each year get together for a yearend function to celebrate the season with fellow colleagues in the Industry. It is a fantastic tradition that builds camaraderie by allowing members to network among each other in a festive and relaxed environment. This year it was held at the Margate Hotel where as is customary, the floating trophy for South Coast Member of the Year was awarded. With support of the Association the main criteria, the award is given to the member deemed to have been most active in the region throughout the year. 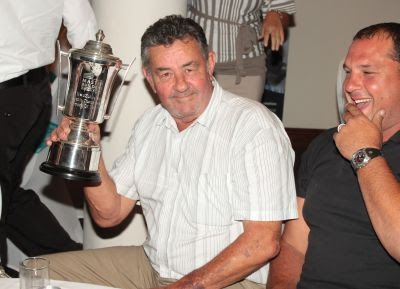 The winner is determined by South Coast Regional Manager Hans Stols and Chairmen Thys Blom and in 2011, it went to Mike Bekker of MCB construction. In the past we have uploaded images from meetings and events as web album slide shows embedded directly into the blog post. This week we launched our facebook page and as will be the way going forward, the images are available for viewing in our facebook photographs menu.